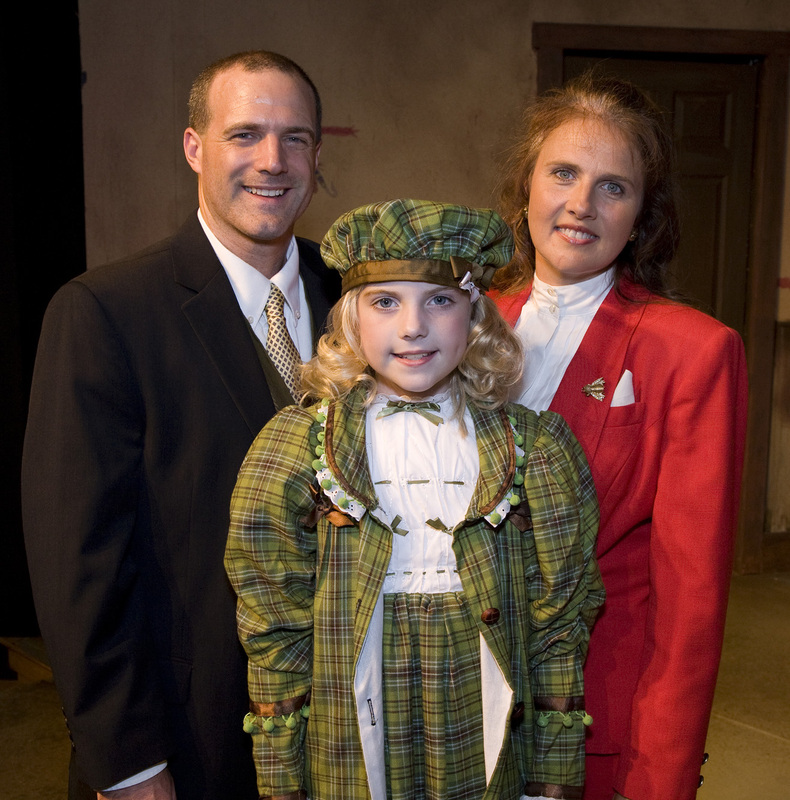 Community Spirit Shines in Players’ MIRACLE ON 34th ST. It was a drizzly, gray Sunday afternoon in Conroe, Texas, but the reception of guests at the Owen Theatre was a warm and royal one. A handsome prince helped arriving audience members in the front door as car after car appreciatively deposited patrons under the theatre portico to avoid the rain. Inside, an equally regal princess welcomed ticket holders to the auditorium. The show would have a familiar plot for the many who had seen the classic film, Miracle on 34th St. Adapted by Will Severin, Patricia DiBenedetto Snyder & John Vreek from the novel by Valentine Davies, this pleasant stage version would warm the afternoon further with its talented Crighton Players and enthusiastic direction from Becky Teague to spread abundant holiday cheer. The simple plot line tells the story of pretty young Susan Walker (Shelby Lambright), whose mother Doris (Katherine Navarra), is an officious executive at Macy’s department store in New York City. Doris has no use for childish dreams of Santa Claus and such, and sadly, little Susan seems to be inheriting that same jaded and suspicious nature. Oddly, Doris is charged with making sure a fine Santa is selected to greet the children who come to visit him at the store. The many youngsters in the cast are delightfully natural as they spice various scenes with their play and laughter. Their lovely 1940’s period costumes were just some of the show’s lovely offerings from designer, Lynn Peverill. Enter Kris Kringle (a very jolly performance from Dale Trimble who will sport a beautiful Santa suit). Kris, as it happens, is actually the real Santa, but gets into all sorts of problems trying to convince everyone of that fact. But along the way he teaches both Macy’s and Gimble’s what the true spirit of Christmas is all about. We meet a variety of great characters in this adventure. Of course there were robust performances from Will Radcliffe as Mr. Macy and Quint Bishop as Mr. Gimble. Bishop, by the way, does a wonderful turn as Judge Harper in the courtroom scene for Santa’s trial. (Yes! 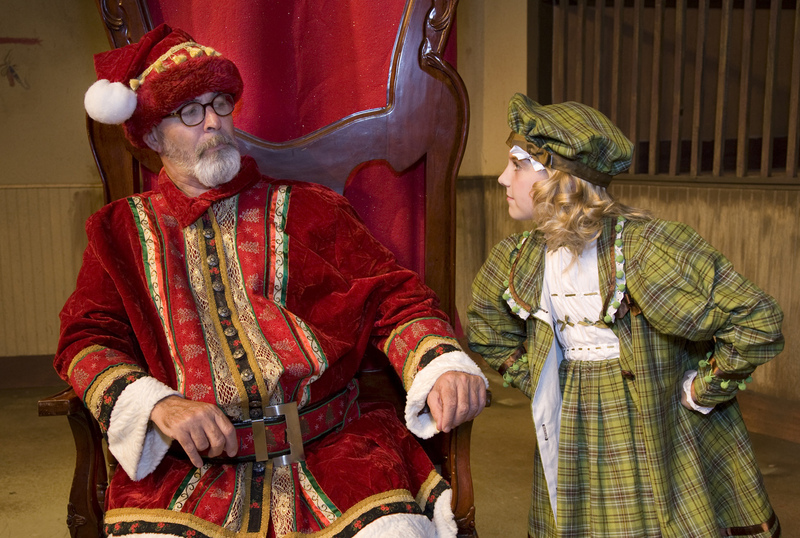 Santa is actually on trial to determine if he is really St. Nick). It’s a highlight of the show, and nicely sparked by the high-strung prosecutor, Mr. Mara (Brent Young), who learns an important lesson from his little son, Tommy (Ian Reina). Terry Woods adds plenty of fun to that scene as the outspoken courtroom observer, Miss Adams, and Sam Junnila adds to the laughs as Mr. Sawyer, the fidgety counselor in need of counseling himself. A secondary subplot involves a slowly budding romance between Doris and her pleasant neighbor, attorney Fred Gailey (a cheerful performance from Gil Guillory). Fred does a fine job of defending Santa with some abundant and very surprising evidence. There are many other characters in an enormous cast of players that are too numerous to detail here, but I must say that Trimble’s subtly wonderful Santa and little Miss Lambright’s sensitive portrayal of both sides of Susan’s evolving personality were standouts in the acting department. Moreover, the collective spirit of the cast was evidence of a wonderful community involvement in the show. That community spirit clearly spilled over into an audience filled with family, friends & neighbors who were getting a good start on the holidays thanks to the Crighton Players. As for complaints, who needs them at holiday time? But do let me put on my Ebenezer Scrooge hat just long enough to suggest that the countless shuffling scene changes were a distraction. That problem was made much less annoying by the wonderful cast of Carolers who sang more than 25 holiday favorites during those excessive breaks in the action. So much for, “Bah! Humbug!” Merry Christmas to all, and May God Bless Us Every One! MIRACLE ON 34th STREET continues at Conroe’s Owen Theatre through December 17th with performances today at 2 p.m. and next Friday and Saturday at 8 p.m. For tickets and information call 936-539-4090 or visit the websites: www.owentheatre.org or www.crightonplayers.org . This entry was posted in Miscellaneous Reviews, The Courier Columns, Theater Reviews and tagged Conroe, Entertainment, Houston, Owen Theatre, plays, Reviews, Texas, theatre. Bookmark the permalink.